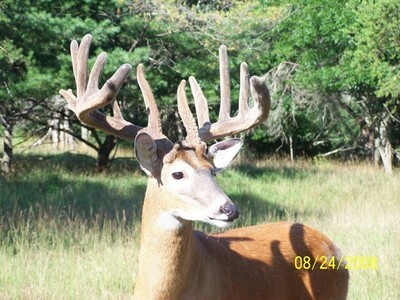 You may pursue one of our excellent Trophy Ridge Whitetails in our genetic controlled herd. Our herd is located on a 140 acre prime Whitetail habitat. We assist you in any way we can to guarantee your success. Plan on several days of hunting these Bucks are not easy. We welcome archery and muzzle loaders and rifle for this program. Physically limited hunters are generally able to hunt this program. Our blinds have easy access. We will do our best to make your harvest a very pleasant experience. Our family has hunted forever and will treat you as we like to be treated. Our hunting experiences have been in Alaska, Africa, Canada, New Zealand and across the USA! We know what hunters enjoy, and we will endeavor to make your hunt or harvest one filled with great memories. Your adventure will take place in heavy oak timber and scattered grassy fields. Adjoining fields of clover, alfalfa, and row crops make a perfect setting for large whitetail!. We provide excellently located tree stands and ground blinds. We only cater to one Whitetail hunting party per week, so the attention you receive will not be divided. 170 Class Whitetail and above when available are individually priced. Please call! If a guide is with you the deer are priced when you see them and they are not scored. If you are hunting alone you are responsible for the size of deer that is killed. One thirty to 140 class deer are $2000. One fourty to 150 class are $3000. One fifty too 170 deer are $4500. 170 Class Whitetail and above when available are individually priced. They start at $5000 Tips are not included but appreciated. Please call ! Doe when available are $200 in conjunction with a buck or elk hunt. Fallow deer are available. *Drawn blood or wound is considered a kill. Whitetail must be capped and tagged before leaving the property. Sept 1st through February 28th.